Sioux City forward Bobby Brink earns third consecutive weekly award, Central Illinois defenseman John Driscoll and Dubuque goaltender Matthew Thiessen earn first set of honors. The United States Hockey League announced the Forward, Defenseman and Goaltender of the Week for Week 28 of the 2018-19 season. 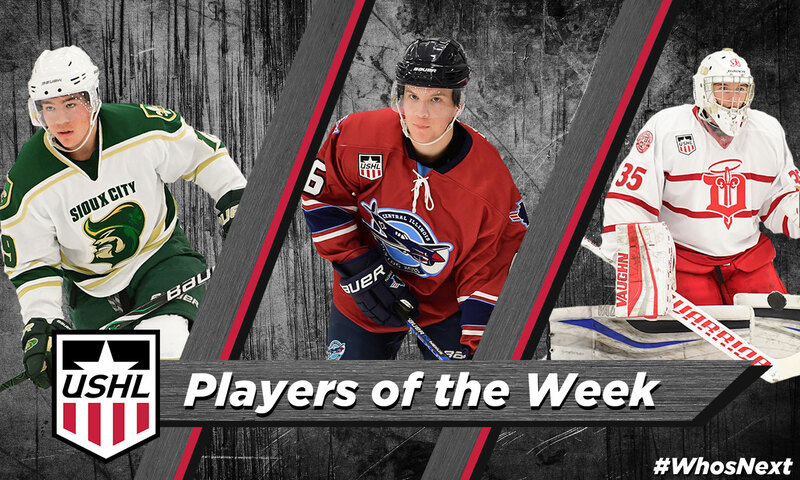 Sioux City Musketeers forward and 2019 NHL Draft prospect Bobby Brink was named Forward of the Week for the third straight week, Central Illinois Flying Aces blueliner John Driscoll earned his first Defenseman of the Week honors, and Dubuque Fighting Saints goalie Matthew Thiessen was named Goaltender of the Week for the first time this season. Brink brought in one goal in each game while also adding three helpers, Driscoll dished out four assists, and Thiessen posted an impressive 44 save shutout over the weekend. The USHL is America’s only Tier 1 junior hockey league, and continues to lead the world in the advancement of Division I college hockey athletes. Brink scored two goals and dished out three assists to earn five points this past weekend. 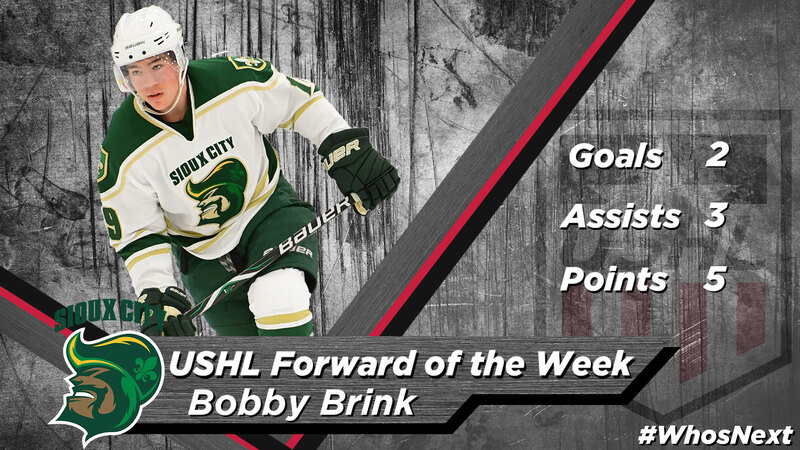 With this award, Brink becomes the first player in USHL history to earn three consecutive Forward of the Week honors, while also tying the league record for career awards with five. The last player to accomplish this feat was Rem Pitlick, who was later named USHL Player and Forward of the Year for the 2015-16 season. Brink is up to 67 points (35G, 32A) in 42 games this season, an average of 1.60 points per game. His 67 points lead all Sioux City players and are also good for fourth among all USHL players. Brink’s 35 goals lead the Musketeers and are good for second among all USHL players. This is the fifth weekly award of Brink’s USHL career, as he was previously named Forward of the Week on Nov. 5, 2018, Feb. 4, 2019, Mar. 25, 2019 and Apr. 1, 2019. The University of Denver commit was listed as a B-rated skater on the NHL Central Scouting Players to Watch List, and was ranked 29th among North American skaters on January's NHL Central Scouting Midterm Rankings. Brink also helped Team USA win a goal medal at the World Junior A challenge. Prior to his time in the USHL, Brink played for Minnetonka High in his home state of Minnesota. 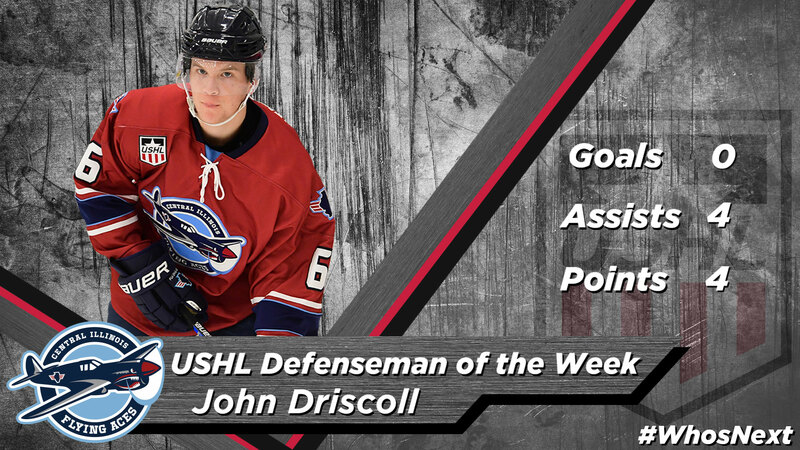 Flying Aces defenseman Joh Driscoll served up four assists, three of which were primary, to help Central Illinois win twice over the weekend. The uncommitted blueliner is in the midst of his first full season in the USHL where he has earned six points, ranking him seventh among Flying Aces defensemen. Prior to his time in the USHL, the Littleton, CO native played for the Colorado Thunderbirds. 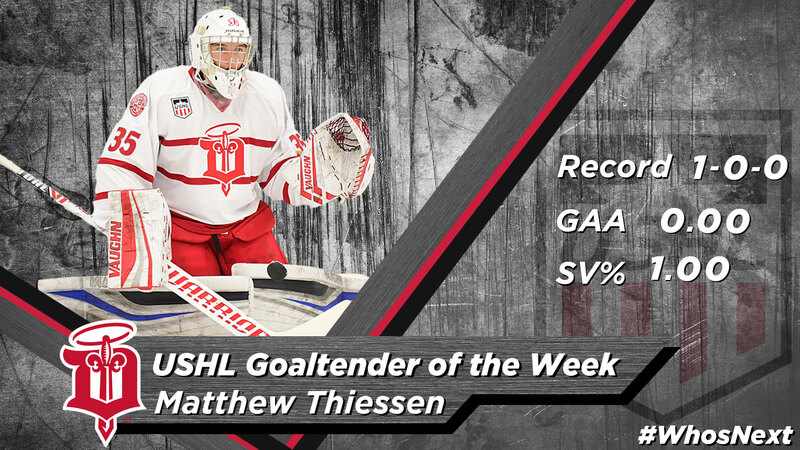 Thiessen stopped all 44 shots he faced on Saturday night to earn the first shutout of his USHL career. The Vancouver Canucks prospect now boasts a record of 18-17-4-4 this season to go along with a 3.04 GAA and .888 SV%. The University of Maine commit is in the midst of his first full season with the Fighting Saints and was drafted 192nd overall in the 2018 NHL Draft by Vancouver. Prior to his time in the USHL, Thiessen played for the Pembina Valley Hawks.